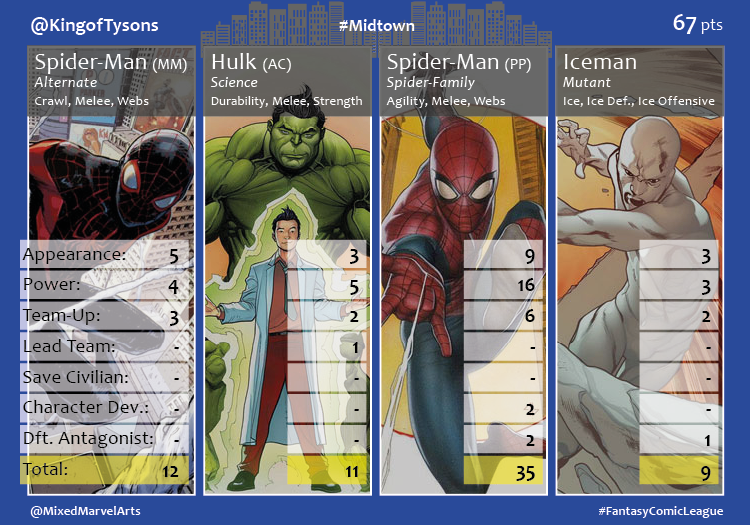 The Midtown Fantasy Comic League agents have protecting the streets of the city down to an art, but they have yet to determine a clear leader in the group. The five-week month of November saw the lead between the agents change four times, but in the end, Agent Natalia came out on top. Collectively, the agents led the #FantasyComicLeague as a whole once again, scoring 311 points as a division. 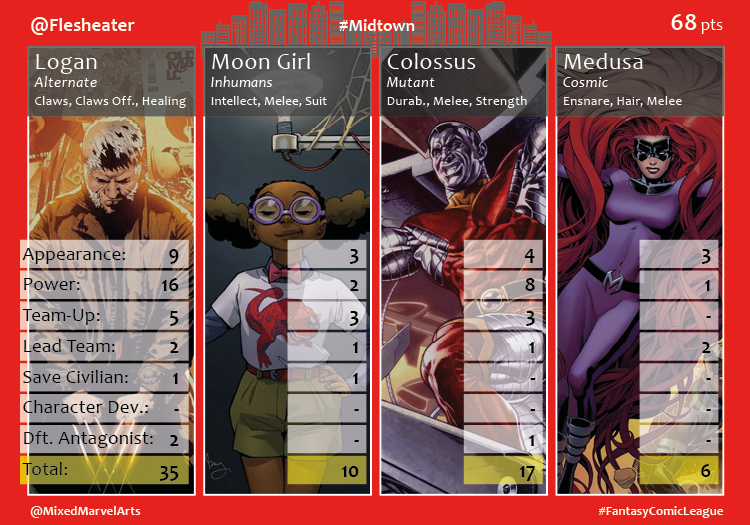 The slow, safe month saw the recruited heroes save only 5 civilians of Midtown. The heroes (drafted heavily from the X-Men and Avengers rosters) teamed up 59 times to defeat 13 antagonists. The month was all about team ups and less about individual characters, as Peter Parker earned two of the three character development moments. The top agent for the month, Agent @nataliaromanov3, relied on her leading ladies who lived up to their roles. 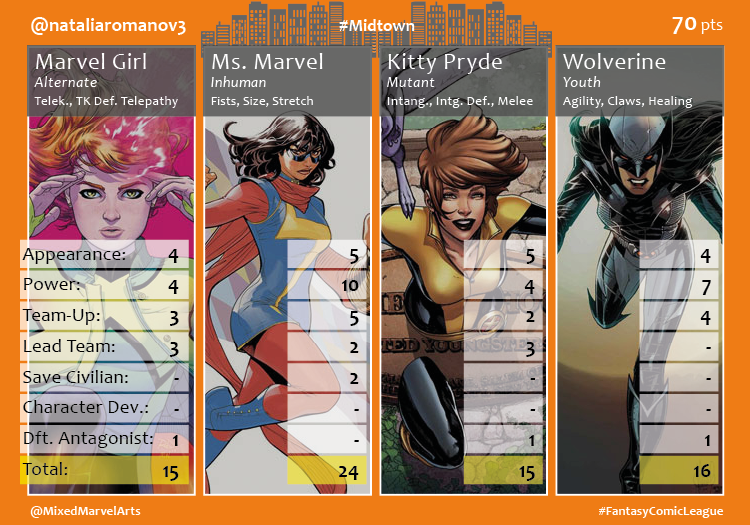 Jean, Kamala and Kitty combined to lead the division with eight call to arms. She finished the month on a high note to steal the lead with 70 points. Agent @Flesheater received an impressive debut performance from Colossus in his first month being drafted into the league. The metallic mutant scored 17 points in support of Flesh’s 68-point, second place finish. Agent @KingofTysons was well positioned the majority of the month, but suffered a one-point final week to slip down to third place. Peter Parker pulled his weight with 35 points, but his trio of younger heroes did not offer enough support. He finished with 67 points. 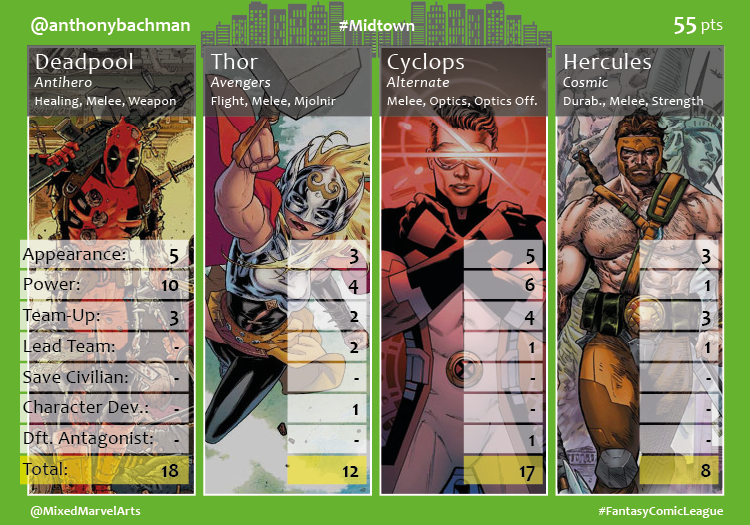 Agent @anthonybachman received a strong performance out of Cyclops and Deadpool, but his godly duo of Thor and Hercules only scored him a combined 20 points. He finished in fourth with 55 points. Agent @Lennie_Roxx, fresh off her victory the previous month, challenged Bachman in the bottom of the division, but was bested by four points. 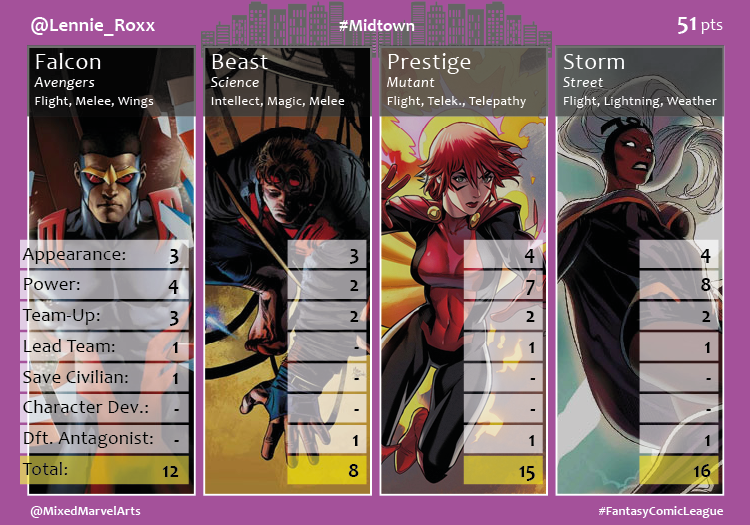 Storm and Prestige represented the X-Men Gold team well for Lennie, despite a 51 point last place finish.